MidwayUSA Patronage Helps Las Vegas Students Discover "Elk Camp"
The typical school day for a Las Vegas high school student might include a math class of some sort, maybe a biology lab or perhaps even an agricultural class. For 160 students last week at "Elk Camp", they got to step out of the classroom and into the RMEF convention hall for a chance to learn about elk, elk hunting and conservation as part of a first-annual educational workshop. "The YWCE is a ground-breaking program that several conservation groups participated in this year," said MidwayUSA Founder and CEO Larry Potterfield. 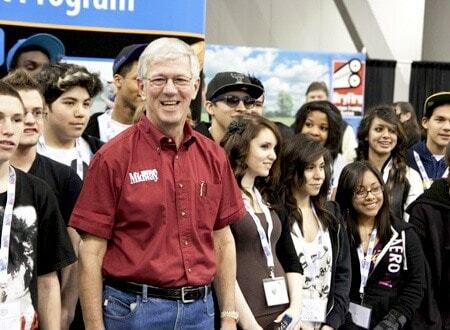 "My wife Brenda and I are thrilled these students were able to experience a day inside an industry we've loved our whole lives. We look forward to more YWCE events at 'Elk Camp' in the future." Participating students had the chance to tour the exhibit hall, look at elaborate booths, and hear from several educators and conservations group leaders, all for free, thanks to the Potterfield's donation. "We continue to be amazed at the vision, commitment and generosity of the Potterfield's and MidwayUSA. We're very grateful for their partnership," said President and CEO of RMEF David Allen. "This program is a fun field trip for local students. We treated the students to lunch and sent them back to school, hopefully with a much better understanding of how true conservation works."